Situated in Harrogate, this cottage is close to Harrogate Theatre, Harrogate Convention Centre, and Valley Gardens. Also nearby are Turkish Baths and Health Spa and Royal Pump Room Museum. 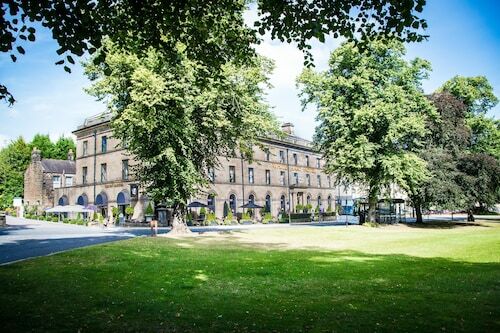 Located in Harrogate City Centre, this eco-friendly hotel is within 1 mi (2 km) of Turkish Baths and Health Spa and Harrogate Convention Centre. Royal Hall and Harrogate Theatre are also within 10 minutes. Harrogate Station is 9 minutes by foot. 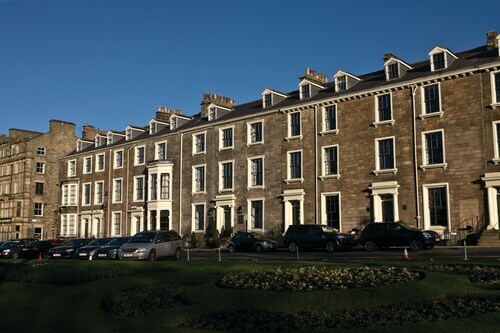 Located in Harrogate City Centre, this hotel is steps from Valley Gardens and Mercer Art Gallery. Royal Hall and Harrogate Theatre are also within 10 minutes. Harrogate Station is 9 minutes by foot and Hornbeam Park Station is 30 minutes. Located in Harrogate City Centre, this hotel is within a 10-minute walk of Harrogate Theatre, Royal Hall, and Valley Gardens. Mercer Art Gallery and RHS Garden Harlow Carr are also within 2 mi (3 km). Harrogate Station is only a 4-minute walk and Hornbeam Park Station is 27 minutes. Located in Harrogate City Centre, this spa hotel is within a 10-minute walk of Royal Hall and Harrogate Convention Centre. Turkish Baths and Health Spa and Mercer Art Gallery are also within 10 minutes. Harrogate Station is 13 minutes by foot. Located in the heart of Harrogate, this eco-friendly hotel is within 1 mi (2 km) of Harrogate Theatre and Harrogate Convention Centre. Turkish Baths and Health Spa and Royal Hall are also within 1 mi (2 km). Harrogate Station is 10 minutes by foot and Hornbeam Park Station is 21 minutes. 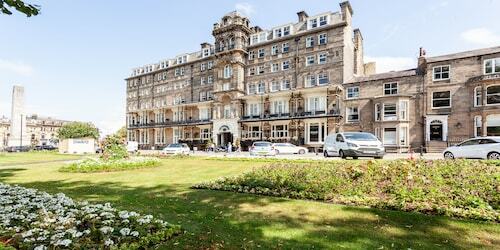 Situated in Harrogate, this hotel is within a 15-minute walk of Harrogate Theatre and Harrogate Convention Centre. Royal Pump Room Museum and Turkish Baths and Health Spa are also within 10 minutes. Harrogate Station is 8 minutes by foot and Hornbeam Park Station is 21 minutes. 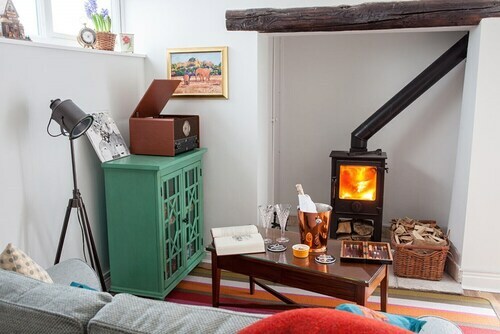 Situated in Harrogate, this cottage is 1.2 mi (1.9 km) from Spofforth Castle and 2.2 mi (3.5 km) from Stockeld Park. Harrogate Convention Centre and Wetherby Racecourse are also within 6 mi (10 km). Located in Harrogate City Centre, this spa hotel is within a 10-minute walk of Harrogate Theatre and Harrogate Convention Centre. Royal Pump Room Museum and Turkish Baths and Health Spa are also within 10 minutes. Harrogate Station is only a 5-minute walk and Hornbeam Park Station is 26 minutes. 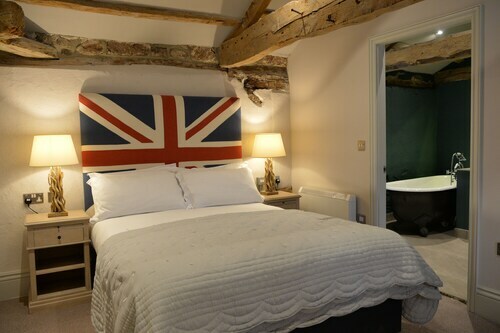 Situated in Harrogate, this hotel is 0.2 mi (0.3 km) from Spofforth Castle and within 6 mi (10 km) of Knaresborough Castle and Wetherby Racecourse. Harrogate Theatre and Harrogate Convention Centre are also within 6 mi (10 km). Situated in Harrogate, this property is within a 15-minute walk of Harrogate Theatre and Harrogate Convention Centre. Turkish Baths and Health Spa and Royal Hall are also within 15 minutes. Harrogate Station is 8 minutes by foot and Hornbeam Park Station is 23 minutes. Situated in Harrogate, this hotel is within a 15-minute walk of Harrogate Theatre and Harrogate Convention Centre. Valley Gardens and Royal Pump Room Museum are also within 15 minutes. Harrogate Station is 6 minutes by foot and Hornbeam Park Station is 23 minutes. There is nothing quite so enjoyable on a peaceful morning as a couple of rounds of golf. So polish your clubs and tee up at Rudding Park Golf Course. To find it, head to the terrific city of Manchester before traveling to Harrogate, about 45 miles (72 kilometers) away. You won’t be left in the cold when searching for accommodation options close to Rudding Park Golf Course. 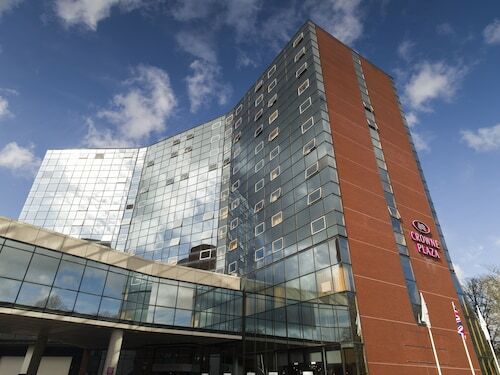 You can choose from 36 hotels within easy commuting distance. 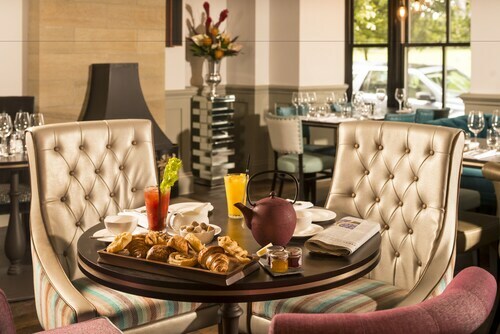 Take a peek at the Wood Hall Hotel and Spa and The Majestic Hotel. Not too far away, you can find some well-priced accommodations the ideal choice for making your savings stretch that much further. Why not consider the Market Tavern and the Alvera Court? A short commute away, you will discover a small range of lavish establishments to spend a few nights. You might want to look into the Crowne Plaza Harrogate and The Grafton Boutique B&B. Horto Cafe is the perfect place to enjoy a hot beverage or a delicious pastry, cake or tart. Thankfully, it's just a short stroll from Rudding Park Golf Course. If it's a hearty lunch or dinner you're after, try Horto Restaurant, a nearby establishment that's frequented by locals and travelers alike. As the day comes to an end, you can celebrate the new memories made at Deer house Family pub, just a few more steps away. Golf is a great way to relax while getting a little exercise. So if you're looking to have a hit, tee off at Spofforth Golf Club. Make arrangements to enjoy the stunning flower beds and enchanting botanical displays at the well-known local privately owned garden, Plumpton Rocks. Tee up at Pannal Golf Club, a lovely place to unwind and play a round or two. Spending a bit of time shopping at Moto-Mania is a good way to blend in with the locals. Understand more about a historic site when you visit the primeval Spofforth Castle. How Much is a Hotel Room in Rudding Park Golf Course? Hotels in Rudding Park Golf Course start at $48 per night. Prices and availability subject to change. Additional terms may apply. Lovely 2 bed in a Great Location!